At a time when most restaurant owners are trying their hand at gastropubs - Gordon Ramsay is a case in point - Tom and Ed Martin have gone the other way. Best known for their string of excellent gastropubs in east London: The Gun in Docklands, The Empress of India in Victoria Park, The Prince Arthur in London Fields, they've opened The Botanist, a bone fide white table cloth covered restaurant for their first eaterie in the west, directly on Sloane Square. Making the transition effortlessly, the food, ambiance and service are all spot on. Mains of grilled polenta or salmon fishcakes are expertly cooked and best followed by apple tart tatin served with caramel sauce and clotted cream. The restaurant is ideally located for a pre or post theatre meal with the Royal Court Theatre just across the square. 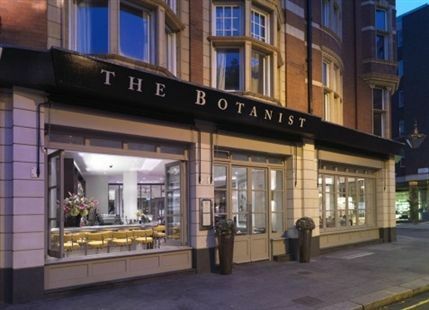 The Botanist gyms, sporting activities, health & beauty and fitness. The best pubs near London The Botanist. The Botanist clubs, bars, cabaret nights, casinos and interesting nightlife. Where to have your meeting, conference, exhibition, private dining or training course near The Botanist. From cheap budget hotels to luxury 5 star hotels see our deals for The Botanist hotels, including Sloane Square Hotel London from 86% off.